This year our family has started the new year with a renewed focus on studying the scriptures together. With children from the age of 12 down to 1, it can be difficult to find a way to strengthen and uplift everyone at the same time. Not to mention, hard to find a time when everyone will sit and listen. After much thought, we decided that right after dinner was the best time for us. (While everyone is already sitting at the table). And thanks to Nicole Carpenter, we have found a new approach that has made the first month of scripture study a fantastic experience for our family. 52 Weeks is a theme-based approach to daily deotionals for Latter-day Saint families. The book offers an assortment of topics from kindness and citizenship to prayer and repentance. Each week has a different topic and then each day of the week has a message already prepared for you. Scriptures and quotes are included. BUT....it is not overwhelming. Last week our family talked about Happiness. We love being able to talk about things for 7 days. It allows us to really cover the topic. And it lets our children think about things each day. Another thing I love about the book is the section at the back that focuses on holiday devotionals. Love and Valentine's Day, Easter and the Atonement, our Nation and Independence Day, Fear and Halloween, Graitude and Thanksgiving and the Nativity and Christmas. The perfect way to keep the spirit in the holidays, year round. 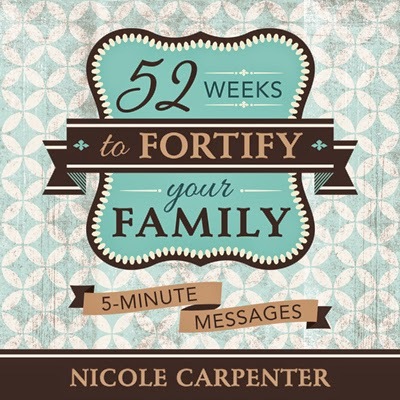 "52 Weeks to Fortify your Family" has completely changed our families scripture study experience. It has taken so much stress out of it for my husband and I. And our children love sitting around the table after dinner and talking. They grab the book each night and bring it to the table with willing hearts and minds. Your family will LOVE this book. "52 Weeks" is already a #1 bestseller on Amazon. If you want your own copy you can grab one online at Amazon, Barnes and Noble, or in Desert Book or Seagull Book. You can enter to win your own Autographed Copy of "52 Weeks" RIGHT HERE! The giveaway will end in one week, on Tuesday February 3rd. Such a fantastic blog here about 52 weeks to fortify your family *GIVEAWAY*. It was a nice decision you taken that after dinner was the best time While everyone is already sitting at the table and focus on studying the scriptures together. Meanwhile I am dissertation writer and dissertation assistance service UK provider to UK students at Dissertation Help UK and I love reading such kind of blogs. Thanks for sharing with us. A one of the best post on Family Giveaway which is work with so many talented women to spoil our readers with products that strengthen the family and make our lives a little easier, too. Thanks for telling to us about it and I am excited spend some time with such bloggers and have some fun. However I am coursework writer and assisting students by providing coursework help service UK at Elite Assignment where the coursework experts offering university students help in coursework writing under the best guidance and pass guarantee. Furthermore, I love to explore such kind of blogs which shares some useful and inspirational information, story and happiness. Right now I have a 4 year old and 1 year old so scripture study is a struggle. I love the idea of this book. We've gone back and forth with reading regular scripture and book of Mormon reader but I really like this approach. Thank you for the giveaway and letting us know about this book! We have my 8 year old (my oldest) read a few verses and then we discuss them, I'm not super thrilled with it, at least it's happening, but this book sounds like just what we need! We do a lot of scripture reading during the holidays but struggle the rest of the year. This book sounds perfect for our family! Thanks for doing a giveaway! Our four kids range from 9 yrs down to 18 months, and while we used to read in the evenings before bedtime, it just didn't work well because everyone was tired and cranky (...including my husband and I). So we switched to right before they leave for school, and it has worked SO much better! Plus, I think they have whatever we've just read on their minds as they get on the bus. :) The large Bk of Mormon for LDS Families has been their FAVORITE version to read - with great visuals and definitions of words they don't know, it's been fantastic for study and discussions on different topics. This book you're featuring sounds great too. Thanks for the chance to win! Woooow.. That's going to be a great experience for everyone to read it. It looks like a personal statement of the family. I would like the same, when I had my own family. But when I do this, I would ask the team of this web site to write it for me. They help me in every period of my life, so I'll be happy them to be on this period too. Halloween Activities For Kids - Kids Halloween Crafts The times are receiving cooler, and the evenings are receiving darker. Fall is merely nearby, and if you are a daycare specialist or professor, you're probably planning your land activities and fall crafts already. Sharing serious and banner waving Happy Veterans Day Images is the simplest approach to celebrate and appreciate the most extraordinary day of the year. We have additionally assembled some great, adorable and Funny Veterans Day Images to spread the genuine substance and satisfaction of the celebration. Our colossal gathering of Images for Veterans Day are impeccably passed on your profound opinions and appreciative sentiments towards your military staff's and will beyond any doubt to fill their heart with joy as a paramount and prominent devour. Thank you for posting this article. I really reading it. you have covered all the aspects so accurately. Keep going on!